Industrial property management is a specialized service and in order to manage an industrial property effectively, one needs to understand the different types of properties in this category and where each one fits into the marketplace. Industrial properties are one of the four main types of commercial properties, the other three being retail, office, and multi-family, and they usually have industry-specific requirements. This is a broad category that covers many different kinds of buildings with multiple uses. These are large, single story spaces that are predominately used to store and distribute stock. These buildings can vary greatly in size and shape depending on their main function. They usually have numerous loading bays and large doors for truck access. Some warehouses and distribution centres have a small amount of office space to accommodate management staff. These are facilities designed to house specialized equipment for the manufacture of goods and materials. The buildings need to be able to supply three-phase high capacity power and often include heavy ductwork, high-pressure air and water lines, ventilation and exhaust systems, storage tanks, and even cranes. Food manufacturing factories also fall within this category and they too have specialized requirements such as, refrigeration, air purifiers, boilers, and floors that are easy to clean and sloped for drainage. To comply with food safety laws, there are strict regulations regarding floor and wall coverings, and the building materials that are permitted in food manufacturing plants. 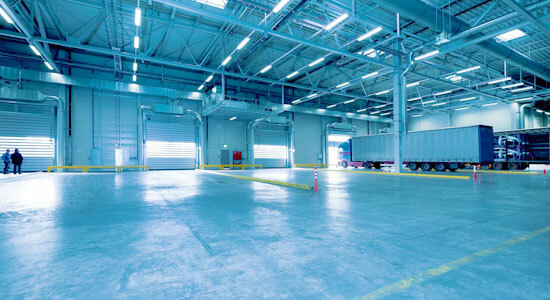 These specialized industrial buildings offer large capacity cold storage. They are used to store perishable food products that need to be in a temperature controlled environment in order to preserve the cold chain. Cold stores not only require specialized refrigeration equipment but also need to be built according to strict specifications. The rapid growth in technology has led to an increase in the need for off-site data storage. Data housing centres are highly specialized industrial buildings and they are usually purpose-built on sites that meet their very specific requirements. These are flexible use buildings that usually include a combination of facilities under one roof. This could be office space, small distribution centres, research and development laboratories, showrooms, light manufacturing plants, and biotech or laboratories. Flex buildings are popular with the technology industry because they provide multipurpose, mixed-use space and can house a company’s offices, light manufacturing plant, warehouse, and research and development labs all under one roof. Flex buildings can also house showrooms and combine retail display space with onsite storage and distribution. Most flex buildings are multipurpose but some, like biotech or laboratories, are highly specialized and need to conform to strict specifications. These buildings usually require dedicated ventilation systems as well as temperature and humidity control. Latitude Property Limited understands industrial property management and we offer our clients an extensive range of services. We know what the market trends are and we can advise clients who want to build new industrial properties or renovate their existing buildings. Good advice and management are key to owning a lucrative industrial property and at Latitude Property Limited we help our clients get the most out of their industrial properties.